It’s been real. Time to move forward to a larger site with more FUN. Upon my graduation, I felt it necessary to change the name from “The Student’s Perspective,” to BAMF MKTG. Not only is it politically correct, but its BAMF awesome. I am still developing the page and seeing that I lost a lot of CSS skills, I will have to re-teach myself. In the mean time, I will be raising issues, posting questions, and starting conversations. Have a topic to discuss? Share it. Nothing is more rewarding than starting conversations with like-minded strangers with mutual respect for marketing. I have finished everything with my Mobile Application Research Study I conducted during my final semester at Winona State University. I attached it below. Copyright is mine, but you are free to use my work as long as you attribute any of my research and the works of th authors and organizations mentioned. After many hours of research, I have formulated my final draft for my mobile application research. I will publish it once I receive it from my advisor. This also brings up another note: I will be changing the name of my blog since I am no longer a student. Any suggestions would be helpful! Audi VS Mercedes has been a battle that has been making ad agencies very happy. Audi, for some time now, has been directly competing against them in their advertisements as a way to change the perception of luxury and fun, much like Cadillac did with their new line of STS sedans. Audi and their new campaign to one up Mercedes in my mind has been fairly successful at changing the luxury perception of Mercedes being “Old Luxury” catering to elite rich folk and Audi becoming the “New Luxury” who caters to the savvy, yet young business man. We have all seen the Audi “Goodnight” commercial, but this one I feel, is a bit more fun. It explicitly pokes fun at Mercedes Benz owners as gullible and snooty. Mercedes responds with adverts about their vehicles but this one is a very direct product of the battle as a response to Audi’s positioning of their advertising. This ad tries to show that they can be fun, too. Both ads have an interesting take on customer’s perception of each brand. One tries to perceive that it is fun luxury, while the other tries to change perceptions that it is just as fun. Trying to remove bias: each brand is attempting to one-up each other. When the consumer enters a high involvement state (ready to buy, more cognitive processing), the consumer who is debating between Audi and Mercedes most likely being their information search, via website. Mercedes capitalizes on on the brand and the image of the vehicle. Adds pictures to the text to reinforce meaning and emotional appeal. 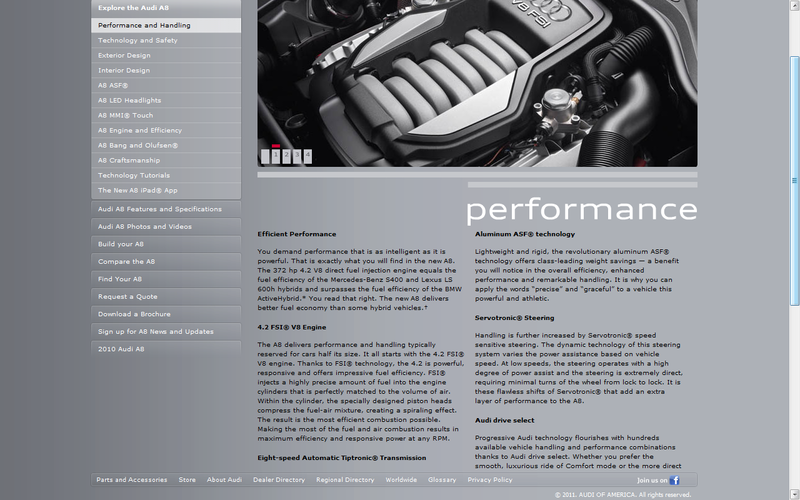 The Mercedes AMG website which is for their high-performance line, it has an interactive presentation and has easily accessible, raw information when the prospective buyer is looking for it. 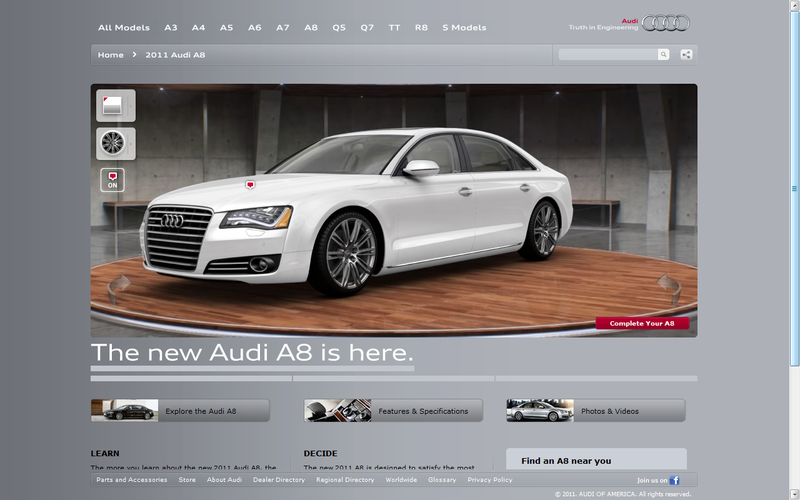 I’m am a die-hard fan of Audi, but their website does not reciprocate the emotional and cognitive appeals from their TV advertisements compared to Mercedes, less interactive presentation. Cluttered links, hard to find technical information and blocks of mass text looks unappealing. 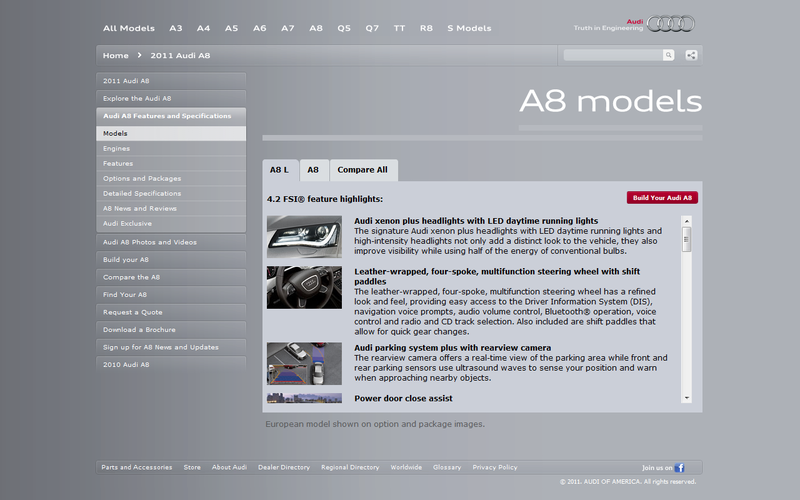 Again, just below this slide show on the Audi website, mass text, nothing organized. Further down the previous page, all text. Audi does a great job changing perceptions that it is the superior luxury brand, but for the consumers who need the raw technical specs to make a buying decision, Audi lacks. This has been quite some time since my last post, so I excuse my delay. I have been transitioning from the European mindset to an American one which proves to be difficult since I have become accustomed to becoming more relaxed (lazy) with life. Now I am trying to create that “competitive position” again inside the chatersphere. Let’s brief you on the topic. As my last semester as an undergrad, I chose to create an independent study. I wanted to understand more about mobile applications; specifically, what motivates users to use them more. This will become a time consuming but very enlightening research study. To start out, I focused on speaking with the experts: ad professionals. Liz Giel, a digital strategist from Fallon recommended MobileMarketer.com as a good resource to check out. Following the 20+ articles I found I moved on to eMarketer.com and numerous others. I felt I had a pretty good direction. It seems to me through a general enquiry of the topic that mobile applications are not yet fully perceived as a cost effective channel to reach target audiences, with a few exceptions. I have found from both agency professionals and articles agree that mobile websites tend to be more effective to reach audiences since anyone with a mobile browser can interact with it. There is a trade off though: Apps get more face time than mobile websites. Now I need to revise my direction. Maybe, how to reach a larger audience with mobile apps? Who knows, they are all good questions and I will go where the research guides me. To be honest, a week after my first impressions, I ditched it. Simply because I felt like I was using Microsoft’s Internet Explorer. It was laggy (for me at least), clouted and distracting. I did have a lot of Facebook activity and RSS feeds from 10 different websites which would update on a constant basis. So for the student’s perspective, the consequences were noticeable. As I would do research for course papers, I would constantly get distracted with updates. Granted it is up to the individual to have self control, but it was if it was taunting me. As I would bore myself with the hours of monotonous research, I had the desire to constantly check on blogs and the latest tech and social media news. However I notice one important factor that determined my frequency of procrastination: “Out of sight, out of mind.” To address this, I simply saw myself using Google Chrome. However, if I am working on social media, RockMelt brought the convenience of organizing updates, grabbing them instantly and made work easier. If you are also a Facebook junkie, you like to keep the Facebook Page open. However, if you are chatting via the web page, it will become annoying when you get two notifications of a chat message and a separate window for the chat log.